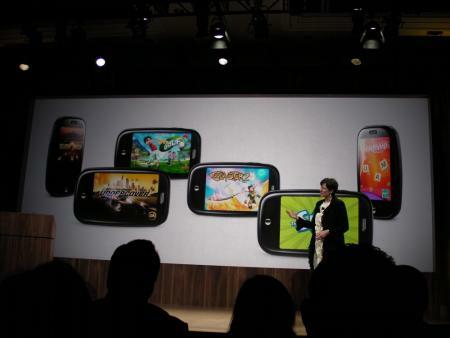 Today at CES Palm announced the release of some high-powered games for webOS. Electronic Arts CEO Travis Boatman was on hand to talk about the new SDK and show of some new apps, including Sims 3 and Need For Speed. These games support full 3D graphics and look quite good. As you can imagine, there's a full set of APIs to make this work. The new apps will be available today. Exciting stuff, people. UPDATE: Palm's native development platform is a "Plug-in Development Kit," or PDK. This allows native apps to hook into webOS and interact with the system, so that you can use stuff like the accelerometer and zooming out to card view pauses the game. UPDATE 2: And we have a press release! It's after the break. 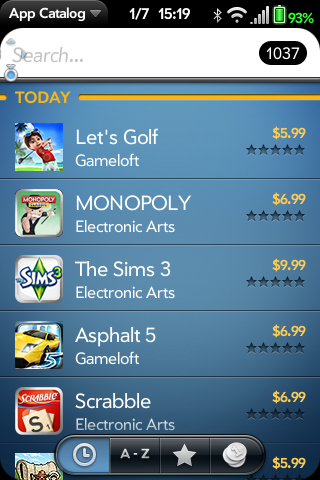 Games listed: Need for Speed Undercover, The Sims 3, Monopoly, Asphalt 5: Elite Racing, Let's Golf!, Glyder 2, and X-Plane. UPDATE 3: And they're here! LAS VEGAS, Jan 07, 2010 (BUSINESS WIRE) -- 3D gaming has landed on the Palm(R) webOS(TM) platform. 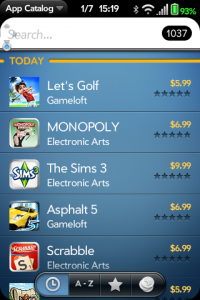 Palm, Inc. (NASDAQ:PALM) today introduced several graphics-intensive game titles for webOS, from leading game developers EA Mobile(TM), a division of Electronic Arts Inc.; Gameloft; Glu Mobile; and Laminar Research. Demonstrated at Palm's CES event, the games will be available today in the Palm App Catalog for Palm Pre customers. Five other mobile games were also introduced: EA Mobile's "Tetris(R)," "Sudoku," and "SCRABBLE(R)," and Gameloft's "The Oregon Trail" and "Brain Challenge." "Recent improvements to Palm webOS represent major advancements in enabling world-class mobile gaming," said Travis Boatman, vice president of Worldwide Studios for EA Mobile. "These innovations have allowed us to quickly bring our best IP to the platform." The developers introducing titles today have had early access to the Palm webOS Plug-in Development Kit (PDK), which extends the Palm webOS Software Development Kit (SDK) with a set of tools, documentation and APIs that let developers write plug-ins for their webOS applications. The PDK lets developers easily integrate C and C++ code into their webOS applications, enabling new functionality, including immersive 3D games. A public beta version of the webOS PDK is scheduled to be available to all developers in March. The Palm App Catalog currently offers more than 1,000 webOS applications for download. Palm's unique over-the-air model also makes it easy for customers to get webOS updates and new features delivered directly to their phones. For example, at CES today, Palm announced that video recording, editing and sharing capabilities will soon be available for users of webOS phones. This new video capability will be delivered automatically to current and future Palm Pre(TM) and Palm Pixi(TM) products via an over-the-air update. Palm also demonstrated Flash content in the browser on a Palm Pre and expects a free Adobe Flash Player 10.1 plug-in to be posted to the Palm App Catalog in the coming months. Palm expects webOS to be one of the first mobile platforms to support the full Flash Player in the web browser. More information about the webOS PDK is available at the newly updated Palm Developer Center (developer.palm.com). More information about games for webOS is available at www.palm.com/applications. Palm, Inc. creates intuitive and powerful mobile experiences that enable consumers and businesses to connect to their information in more useful and usable ways. The company's groundbreaking Palm(R) webOS(TM) platform, designed exclusively for mobile application, introduces true multitasking and Palm Synergy(TM), which brings your information from the many places it resides into a single, more comprehensive view of your life. Palm, Pixi, Pre, Synergy, and webOS are trademarks of Palm, Inc. MONOPOLY and SCRABBLE (in the U.S. and Canada) are trademarks of Hasbro and are used with permission. All other trademarks belong to their respective owners.